Back in the day, whenever someone ordered chicken from a fast food restaurant it was very likely that they were getting fried chicken or roasted chicken. Grilled chicken from fast food restaurants wasn’t exactly a trending concept back then because people weren’t as health conscious as they are now. No one was counting calories and looking at the nutritional facts whenever they bought food. The basic concept was: if it tasted good then it was good for them. Now that is no longer the case and for good reason too – fried chicken isn’t exactly healthy and the grilled chicken from fast food chains is a step in the right direction. First of all you have to understand what makes grilled chicken so much better than regular deep fried chicken. 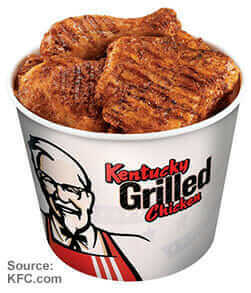 Fried chicken tastes good, there is no doubt about that, but it is so unhealthy that even KFC, the so-called King of Fried Chicken, is now serving grilled chicken alternatives. What makes fried chicken so bad and what makes grilled chicken so good? When you fry your chicken you have to first start with the batter. The ingredients in the batter alone are rich in sugar and lots of saturated fats. As a matter of fact, the batter alone contributes to over 60% of the 21 grams of fat per chicken on your plate. Also you have to consider the amount of oil and grease that the chicken swims in while it is frying on the pan. Even if the restaurant uses vegetable oil there is still a high amount of sodium and saturated fats. When you grill, you are free from a lot of those issues. Grilling doesn’t require cooking oil and this means your chicken isn’t going to be wading in a pan filled with greasy oil. This automatically means the chicken is absorbing less and less unhealthy elements. Another factor is the fact that it is cooked on the grill. Grills have openings and when the chicken is heated, it pushes out its own fats and oil. These will drip down and instead of swimming around the chicken as it would in a pan it will simply go down directly to the heated coals. Everything is cut down in half. The amount of sodium might still be a tad bit too high for some but this is a radical decrease all caused by a different method of cooking. That is something you cannot deny. It still doesn’t mean that grilled chicken from fast food is a perfect food choice for healthy living but it does mean you can eat at a fast food restaurant without feeling entirely guilty of giving in to pleasure foods. You can at least enjoy some of the good stuff without worrying about overstuffing your body with high amounts of calories, sugar, and fats. Since this is chicken it is also pretty high in protein and other substantial essentials for achieving a healthy and fit body. However, you shouldn’t just rejoice for eating grilled chicken. For one thing, if the chicken still has the skin intact then you are still wallowing yourself in saturated fat. The skin is the part of the chicken that pretty much absorbs all the calories and fats during cooking so if you want to play it safe then have them remove the skin before cooking or at least remove the chicken before chomping down on your plate. Also, all those health benefits of eating grilled chicken will get you nowhere if you are going to make up for the lost calories and fats by sautéing the chicken in barbecue sauce or dipping it in processed mayonnaise. Thick servings of gravy and mashed potatoes could do the same thing as well. All your hard work to eat nothing but grilled chicken will be for naught because you are simply replacing the old sources of fat with something new. It is in these cases where food proportion becomes just as important as the food itself. Grilled chicken might be something healthier in fast foods but you also have to focus and concentrate on what you eat, ensuring that you don’t break the promising appeal of grilled chicken served in fast food outlets with all the unnecessary additives, dips, and others. If you want top of the line grilled chicken from a fast food restaurant then look no further than Chipotle Mexican Grill. The name alone should make it obvious. The restaurant is known for catering to numerous environment-friendly ideas and of serving some healthier meals when compared to other fast food chains. It won’t be healthy enough to sustain a good diet but it is the better choice when compared to McDonald’s and other leading fast food chains. The key is that Chipotle serves grilled chicken and the fact that all of their ingredients are organic food (including the chicken). Organic food is basically food that was made without any processed or synthetic chemicals. There were no insecticides and pesticides used on the vegetables served in their meals, the cattle and chicken were only fed chemical-free meals and were not subjected to added hormones, and no antibiotics were given as well. This means you are eating chicken that is 100% all natural, the way nature would have served it. When you buy a chicken burrito from Chipotle you are getting a grilled chicken burrito. This emphasizes the health benefit that you get. As a matter of fact, comparing their chicken burrito to those served by other fast food chains will help you see a significant difference. The ordinary burrito served in most fast food chains contains roughly 850 calories but the grilled chicken from fast food chain Chipotle Mexican Grill contains 380 calories.